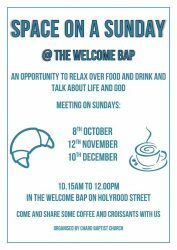 Space on a Sunday will take place on the following Sundays, from 10.15am - 12noon in the Welcome Bap: 8th October 2017, 12th November 2017, 10th December 2017. Do come and share some coffee and croissants with us! Space on a Sunday is back! 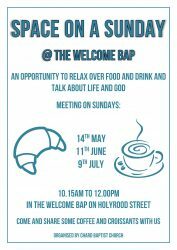 The dates for this, in the Welcome Bap from 10.15am-12noon, are 14th May, 11th June and 9th July. Come and join us. Space on a Sunday is back! Space on a Sunday returns on 4th September 2016. 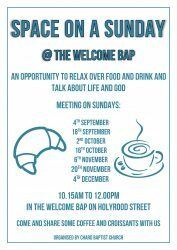 Have coffee, croissants, and chat with us in the Welcome Bap coffee shop on a Sunday morning.